Xiaomi's drone was the first drone I ever bought. It arrived quickly, with good packaging and easy instruction for assembly. I got it for my Croatia holiday and got some truly amazing footage with it. I'm satisfied with my purchase.The good:- easy setup and controls- flying is smooth and thanks to beginner mode you can quickly learn the basics- great quality of the product- long drone batter life (about 20 mins of flying and filming per battery pack)- very long controller battery life (seriously - it easily lasts for 2+ hours)- photo and video quality is good for a product in this price rangeThe bad:- compass sometimes refuses to work with you and you need to reposition the drone to launch it (shows as a compass calibration error in the app) - it's more of a quirk at this point- some of the video filming settings reset each time you power up the drone (remember to re-set those every time you film)- camera doesn't hold white balance - even with a selected filming mode, some white balancing is made (something to remember when shooting video)- controller range heavily depends on the location and terrain (works best with clear spaces)- camera has sometimes problems with setting proper horizon and shoots skewed (about ~1 in horizontal rotation axis - easily fixable in postproduction, if you do any) Conclusion:This a very good product that can easily compete and beat other at this price point. It has a couple of quirks and annoyances (like the reseting video settings and compass errors), but overall I would still recommend buying it, especially if it's just for filming something for yourself or your family. It can take very good pictures and videos.This is not a professional drone - so if you're looking to shoot high quality videos and then post process them it won't be very easy (there no D-LOG preset). Hope that helps you make your decision! 🙂 Solo per essere puntigliosi, nell’App per poter pilotare il quadricottero manca la funzione follow me, del resto ottimo. The drone flies fantastic. About 65km/h, reacts perfectly to the remote control input. In fact it is a great improvement over the DJI Phantom 3, which I also have.The quick release on the props is much better on the mi drone then on the p3. The drone reacts and flies better then the p3, but is also slightly larger.You can only make the image brighter or darker on the remote control. There is no setting to change ISO or shutterspeed, so I like the p3 in situations where I want to keep an eye on these settings.The app has seen great improvements from the time it was launched, it doesn't crash for me anymore.If your phone has an issue in flight, you still have controll over the drone with the remote, so allways keep the drone in your sight to minimize risk.The app has several options of automatic flight, use these to prevent pilot error.If there is a connection issue with the drone, the drone will return to home automatically, so do not take off under trees 🙂 My maximum distance flown in one trip was about 1.5km and back with no issues.The 4k camera is stable these days. There is allways a possibility of tilting a few degrees, but if you don't pan around too much while filming, this is no issue. On photo's you can just straighten the images on your phone or pc. 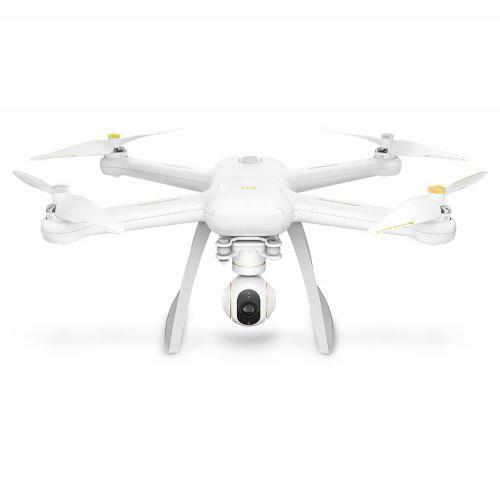 For photography this is one of the cheapest ways to get a drone with 4k camera and raw photo capture, which are a great improvement over just .jpg files when you post process images.If you do crash, there is the possibility to buy a replacement camera and other parts, should you need them. The repair warranty of one year is voided if you crash.There is no care refresh possible, unfortunately.All in all a great drone, I've added a phew of my photo's, but the 4k video's are also impressive. Есть и недостатки. Про проблемы компаса знают даже те, у кого нет данного квадрокоптера. В моем случаи, компас калибруется без проблем, но во время полета всегда ругается на компас. По камере. Стабилизатор плывет во всех трех осях, но не всегда и не всегда в трех. У меня сильно заметно в горизонтальной плоскости. Камера медленно поворачивается по часовой стрелке, примерно на 5-6 градусов, потом раза в 3 быстрей возвращается, но во время полета это «уплыванени» не заметно. Автоматические режимы съемки настроены не очень хорошо, даже, наверное, скорее плохо. Особенно баланс белого, присутствует постоянная засветка. Цветопередача тоже желает лучшего. Но думаю, что не всё можно улучшить программно, нужно умощнять «железо», а это повлечёт за собой очередной значительный минус – УДОРОЖАНИЕ.